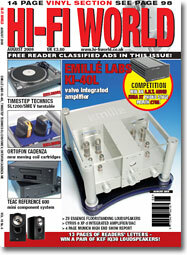 (July 09, 2009) Enjoy the Music.com, a leader in consumer electronics information plus equipment and music reviews for approximately 15 years, is pleased to announce that British magazine Hi-Fi World has come aboard. This marks the eighth magazine, the third within the past two months, which has joined what has been referred to as the Internet's leading site for high-end audio consumer electronics reviews and information. There is little doubt Enjoy the Music.com is now considered as the leading resource for the high-end audio industry. Hi-Fi World magazine joining Enjoy the Music.com once again extends and broadens the ability of the site to provide consumers more information on virtually every facet with high-end audio. "As our name suggests, Hi-Fi World is an international magazine that seeks out the best in high quality audio equipment of any type," says Editor David Price. "Distributed to 42 countries, our readers are from all four corners of the globe. We don't discriminate over the country of origin of the kit we review, or even its age, which is why you'll see a most diverse and eclectic range of products given pride of place providing the performance warrants it. Much as we love classic kit however, we're never nostalgic, so everything gets judged on its merits. From vintage valves and vinyl to computer audio, via the very latest in high resolution digital, Hi-Fi World is biased in favor of great sounding products and nothing more." "The say good things come in threes and welcome HI-FI World magazine as the third magazine to join Enjoy the Music.com within the past two months," said Editor Steven R. Rochlin. "Hi-Fi World's no-nonsense and straightforward approach reinforces the many facets within the consumer electronics magazine venue. Their knowledgeable staff and diversity in equipment reviews brings a broad range of article for nearly everyone to enjoy. This new alliance further benefits Enjoy the Music.com readers so they may subscribe or, if they so choose, to purchase individual issues for digital downloading." Enjoy the Music.com has been the web�s leading information site for audiophile music and equipment consumer electronics since 1995. Over the years the site has received critical acclaim from worldwide Web surfers and other like-minded audio publications both on the Internet and in print. Being affiliated with four prominent print publications while also offering its own Review Magazine, Superior Audio, DIY Magazine and Classic sites � with 120 show reports online to date � Enjoy the Music.com has become the leading Internet authority for diverse information serving both audiophiles and music lovers worldwide. Enjoy the Music.com is also the only specialty audio site with its own Internet browser, mobile device site and RSS feed so their readership can easily find information they desire. Enjoy the Music.com is currently official Internet partners with The Absolute Sound, hi-fi+, Hi-Fi World, The Audiophile Voice, HIFICRITIC, The Sensible Sound, Sound Practices and VALVE magazine.